At Vibrant Family Chiropractic we tend to eat real food, nothing too processed and minimal grains. Having said that – sometimes it’s nice to have a treat to whip up on the weekend. Here are two such recipes (sourced from other websites – links below the recipes) that Matt’s wife Megan is a big fan of for the occasional sweet treat. Add all ingredients, except chocolate, to blender. With damp hands, roll walnut sized balls. Tip: squeeze the mixture initially to compress, then roll. Ensure hands are kept damp. If your hands are hot, they will go oily but this will not impact the final product. Put balls in the freezer for 20 min. After 20 min, melt dark chocolate over double boiler (or in microwave). Pour extra desiccated coconut into a second bowl. 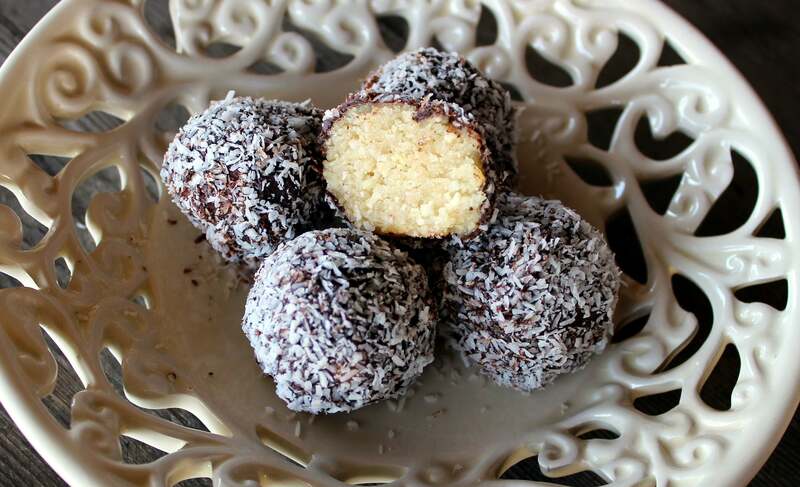 Coat the frozen bliss balls in chocolate, and then coconut one at a time. Refrigerate for 30 min or until needed. Preheat your oven to 175°C. Combine all the ingredients, except for the chocolate chips, in a food processor and process until very smooth. Make sure to scrape the sides and the top to get the little chunks of chickpeas and process again until they’re combined. With wet hands, form into walnut size balls. Place onto a Silpat or a piece of parchment paper. If you want them to look more like normal cookies, press down slightly on the balls. They don’t do much rising. Bake for about 10 minutes until browned on top. The dough balls will still be very soft when you take them out of the oven. They will not set like normal cookies.